My Boracay Guide is here in Boracay, and we are here to help! All new hotel reservations will now feature our MyBoracayGuide Welcome Kit! It’s completely FREE, and will be waiting for you at your hotel at check in. Everyone needs to be connected – now you can be sure. Top up your load or credit anywhere. Most importantly, you have instant access to our 1-800-10-BORACAY telephone number for immediate assistance. Free MyBoracayGuide VIP card – discounts at many Boracay Establishements! 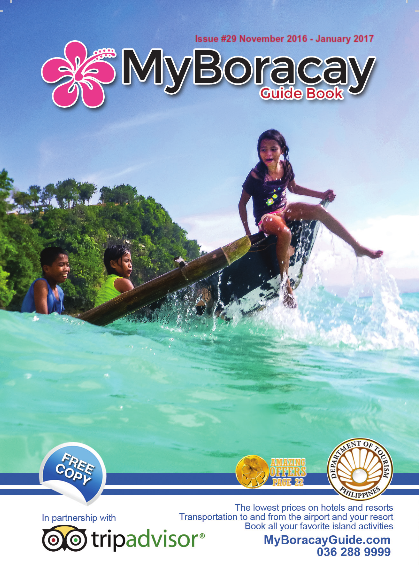 Free MyBoracayGuide Book – Boracay Island’s Best Guide Book! Free MyBoracayGuide Map – Detailed and Updated! This entry was posted on Tuesday, February 7th, 2017	at 6:10 pm	and is filed under Specials, 最近	. You can follow any responses to this entry through the RSS 2.0	feed. You can skip to the end and leave a response. Pinging is currently not allowed.